The queen of the Murry: PS Emmylou paddle steamer. Big Yellow Taxi is blaring from an approaching speedboat as we sit down for dinner, at tables arrayed along the PS Emmylou's deck. Then it tears past with water-skier in tow, causing a wave which slaps the side of our paddlesteamer and gives two diners an unexpected splash. Within moments the crew have resettled the duo at a dry table, and we all share some good-natured banter about the incident. The Murray River may not be the Nile or the Rhine, but it has its exciting moments. You don't know what you've got till it's gone, as Joni Mitchell was just singing, and that verse could apply to our departure port of Echuca. In the 1860s the Victorian government built a railway from here to Melbourne, spawning a busy paddlesteamer trade from all corners of the Murray-Darling river system. 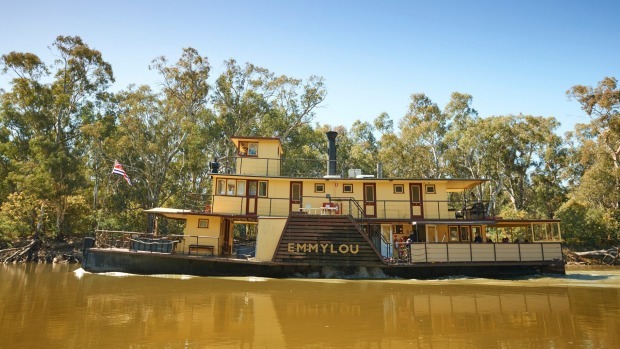 In the 20th century, however, Echuca faded as a port – except for paddlesteamers serving tourists, of which the wood-fired PS Emmylou is arguably the queen. Though built in 1980, the Emmylou, named after country singer Emmylou Harris, is the epitome of the paddlesteamer at its height – an attractive timber vessel painted yellow and brown, its two passenger decks topped with a square wheelhouse. At each side are the boxy housings of the paddlewheels, turned by a steam engine from 1906. Originally operating in a sawmill, this dark green engine occupies the centre of the lower deck. You can sense the appeal of steam in its vigorous motion; it seems more like a living, breathing beast than a machine. What makes the Emmylou stand out among its sister vessels are its multi-day cruises. 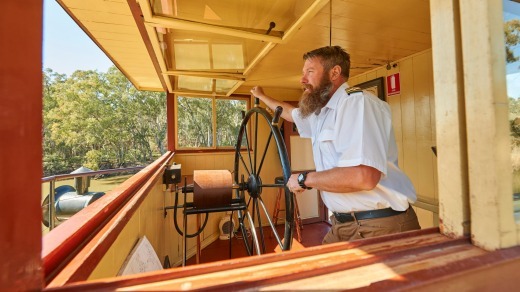 Recently refitted to a luxury standard, the paddlesteamer offers comfortable accommodation on a return trip from Echuca, with excursions along the way. Our cabin on the upper deck is impressive. It's compact, but neatly organised with a proper bed rather than bunks, its timber walls painted in soothing green-grey tones. There's plenty of storage space under the bed, along with coat hooks, hangers, and a single handy drawer. The en suite is small but well set out, with a shower, toilet, and space for toiletries. With the aid of an airconditioning unit and a door panel which lets in fresh air, the cabin is a pleasant place. But we're not likely to spend much time here beyond sleeping, as there's plenty of space aboard to sit and enjoy the scenery, while reading or chatting. With a maximum of 18 passengers aboard, this is clearly going to be a social cruise. We start bonding with the other passengers over dinner, sharing our disdain for reckless speedboat drivers. Our deckmates are mostly from Australia, from a spread of locations: Melbourne, Brisbane, the Hunter Valley, and Tasmania's Bruny Island among them. They're an older crowd, but it seems to me this cruise could work just as well with younger couples wanting a break from the big city. As we sail downriver and the sun starts to set, I can feel myself relaxing. After we pass the former Wharparilla Station which, like the Emmylou, featured in the 1980s TV series All the Rivers Run, I gaze at the Murray's high banks, littered with fallen tree trunks. My reverie is interrupted by a plate of Tasmanian salmon with seasonal vegetables and herb crushed potato, served to my table by one of four crew on board. The dish is excellent, tasty and well presented, as was the smoked salmon blini and arancini entree. A consistent feature of this cruise over the next few days, we will discover, is the high quality dining; an impressive achievement given the compact galley and the cook's inability to pop out to the shops for extra supplies. Not that we always eat onboard. On day two, we're off the boat for excursions. After breakfast a bus takes us to Barmah National Park, home of the nation's largest river red gum forest, to join a nature cruise aboard the MV Kingfisher. 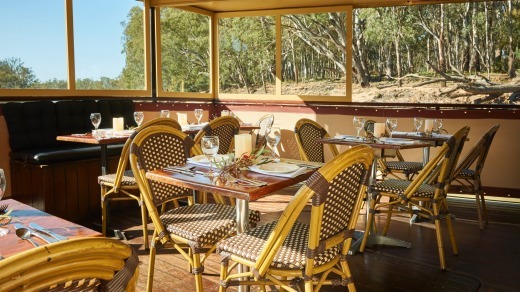 The dining area: PS Emmylou paddle steamer Murray River. This small excursion boat is able to penetrate waters too hazardous for a paddlesteamer, and its pilot Benita provides a running commentary as we pass through the narrow Barmah Choke where the Murray flows twice as fast as elsewhere. There's plenty of wildlife here and we spot a number of native birds, along with a couple of red-bellied black snakes swimming across the river. Lunch is on the deck at Morrisons Winery near Moama, and it's excellent. It's followed by a presentation at a local smallgoods manufacturer, which is less successful, as we've just eaten and it's too hot to stand for long outdoors. Back at Perricoota Station where the Emmylou is moored, the evening events are a delight. We walk to Perricoota Homestead, a grand old residence which resembles Downton Abbey more than a classic Aussie farmhouse. Nowadays it's rented out to groups as accommodation, and we're allowed to wander through and admire the Victorian-era grandeur (though Narrelle and I, both being writers, use the setting to concoct plots for chilling ghost stories). 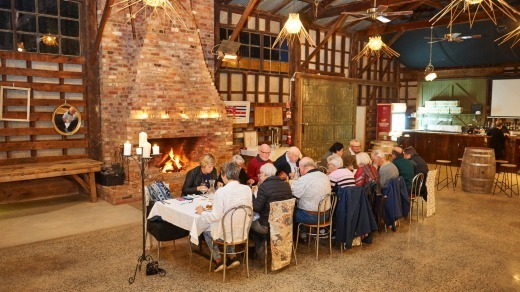 Dinner is at the estate's Packing Shed, now an atmospheric restaurant with a lofty iron roof held up by timber rafters. Sitting along a candlelit table, we passengers are getting to know each other – there's much lively chat and even a bit of song towards the end of the night. I'm looking forward to our final full day aboard, simply because there's little on the agenda. There's much to be said for interesting excursions, but also for sitting above the stern on the upper deck, reading and taking in the passing riverine beauty. We're heading slowly upstream now, back to Echuca, spotting random life among the eucalyptus trees on the riverbanks: holiday makers parked in motorhomes, Major Mitchell cockatoos flying by, pelicans perched on logs, even a family of goats returning our curious gaze. It's time to try something we've all been invited to do: have a drive. Ascending to the wheelhouse, I find Adam in charge of the vessel, managing a very big wheel as seen on pirate movies. As I take the wheel, two cockatoos fly across the water, which I hope is a good omen. Steering the Emmylou is both easy and difficult – easy because we're moving slowly, but difficult because there's a distinct delay in movement after turning the wheel. The vessel's master has to continually anticipate the river ahead, and be ready to adjust. The day ends with a barbecue on the riverbank, at a long table under the stars. As we wait for the meal to be cooked by the crew, a guitarist entertains us with songs around a campfire site. Beyond the inevitable Neil Diamond numbers, one of the songs is Proud Mary. Couldn't be more apt. Tim Richards travelled courtesy of Murray River Paddlesteamers. Echuca is 220 kilometres north of Melbourne, about 2.5 hours' drive. 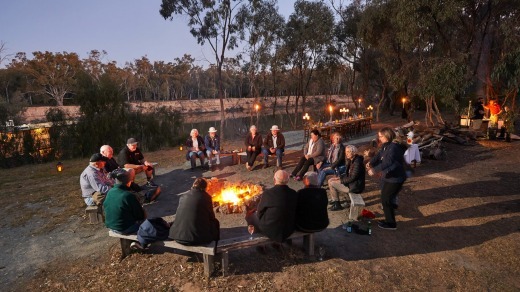 Alternatively, Murray River Paddlesteamers offers a return luxury transfer from Melbourne at $368 per person, including accommodation at the Melbourne Hilton Doubletree and a winery lunch en route.